Are you looking to revitalize your hardwood floor? A well-maintained hardwood floor will last the lifetime of your property, and wood floor refinishing is one of our specialized services. Hardwood floor refinishing is a quick and cost-effective way to refresh the look of your hardwood floor and home. Wood floor refinishing will remove scratches and scuffs, making your floor shine like new again. We recommend refinishing your hardwood floor every 5-15 years, depending on the wear and tear that your wood floor endures. You may also wish to refinish your floor for important events, where it is crucial that you show the beauty and value of your hardwood floor. 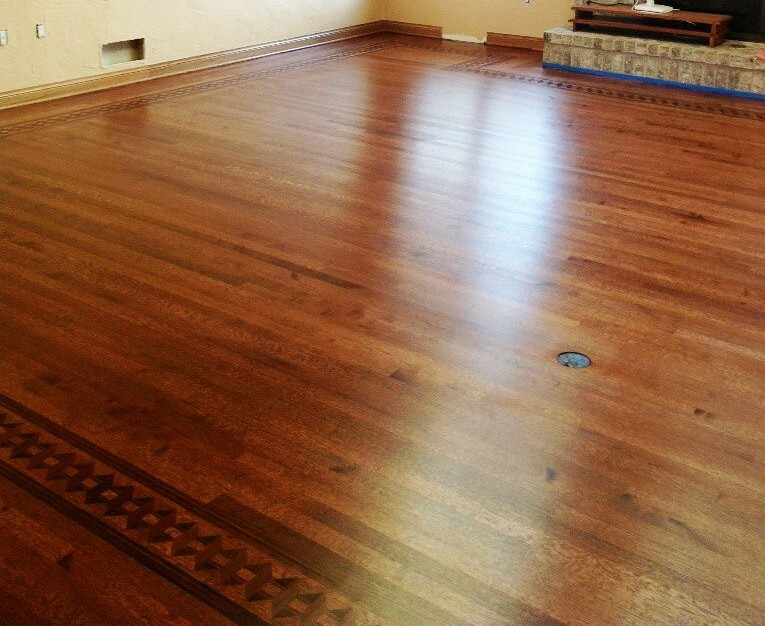 Our hardwood floor refinishing service includes cleaning, abrading, sanding, repairs (where needed) and recoating. Thanks to our Atomic Dust Containment System (Atomic DCS®), we can offer the cleanest floor sanding service available on the market. Our clients are surprised and thrilled with the results of this dust-free sanding system, especially if they have used another system in the past. It is the healthiest option for you, your property, and our employees too! While we can do any kind of hardwood floor refinishing, we recommend using a water-based floor finish, as they are non-toxic, durable and safe for your family and pets. Using a combination of sealers and stains we are able to offer the same look and feel as other types of hardwood floor finishing products yet maintaining the health value of the water-based floor finish. Water-based floor finishes are also non-yellowing and will not change color over time, highlighting the true beauty and elegance of your wood floor for years to come. We use BonaKemi finishes because they are environmentally safe with low volatile organic compounds (VOCs). With no hazardous toxic fumes, you don’t have to move out of the house during refinishing. As the finish dries, water – not toxic solvents – evaporate into the air, leaving the protective polyurethane coating on the wood. This makes wood floor refinishing extremely convenient. Hardwood floor refinishing is fast! 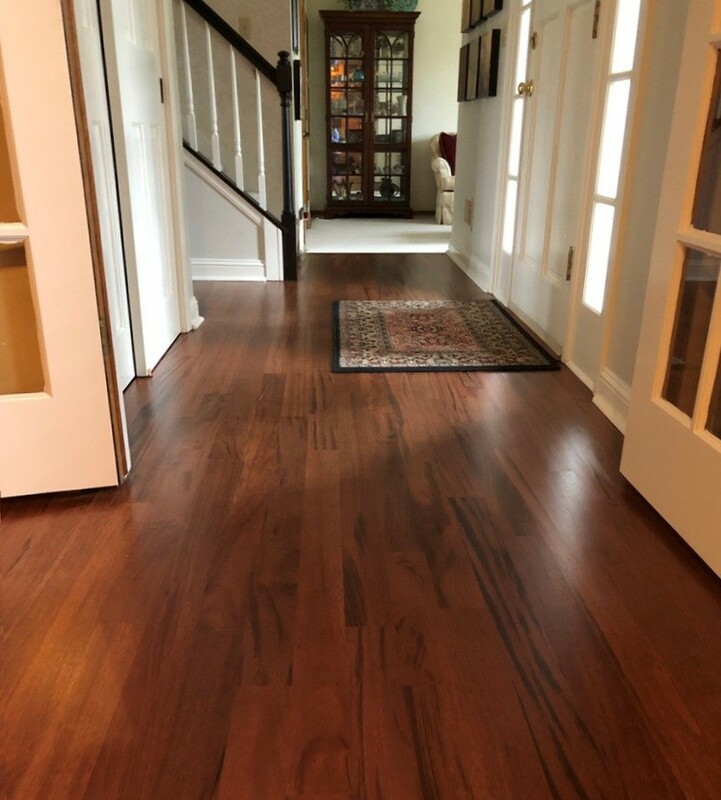 Our service usually only takes a few hours and you can walk on your newly refinished hardwood floor, with stockinged feet after only eight hours. Furniture can be placed back on the floor (not dragged) after 12 hours. Please wait a full ten days before laying your rugs on the floor, it takes ten days for the finish to be fully cured. Hardwood floors add beauty and value to your home and refinishing your hardwood floors regularly is the best way to enhance and preserve that beauty.